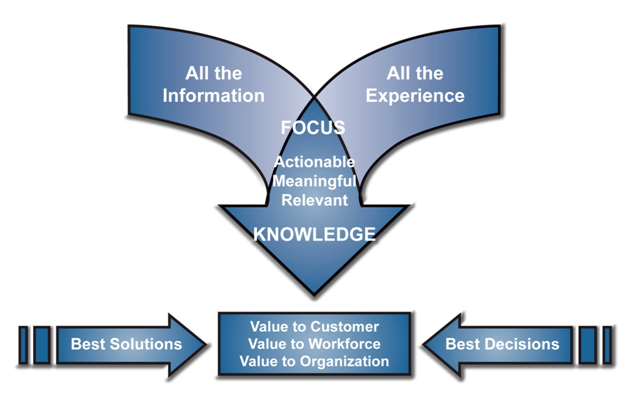 We view knowledge as comprising “all the information” in the organization and “all the experience and insight” in the organization. By leveraging and focusing this knowledge, in context, you will not only be able to improve your individual, team, and corporate performance, but also you will be able to deliver value to your employees, your clients or customers, and your organization. This will enable you to make the best decisions and to develop the best solutions. 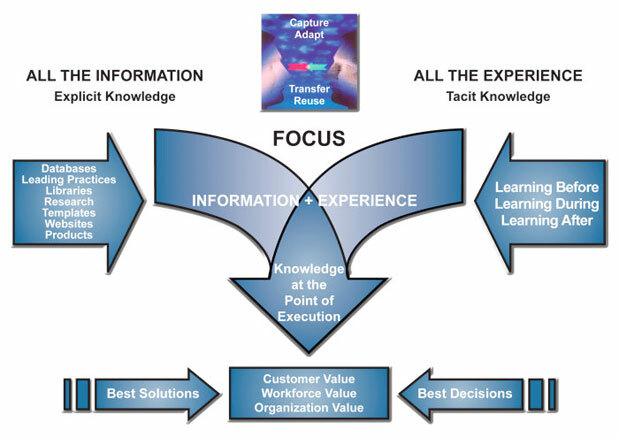 The concept of Knowledge at the Point of Execution integrates an ability to connect, collect, and collaborate with a discipline of learning before, learning during, and learning after process execution to provide your organization with the ability to access in real time not only codified knowledge (effective practices, relevant documents, templates), but also the most current tacit knowledge (experience and insight) that is the “know how” and “know why” of your business or operation.